Synopsis: Hildy and Paul each have their own reasons for joining the university psychology study that asks the simple question: Can love be engineered? The study consists of 36 questions, ranging from "What is your most terrible memory?" to "When did you last sing to yourself?" By the time Hildy and Paul have made it to the end of the questionnaire, they've laughed and cried and lied and thrown things and run away and come back and driven each other almost crazy. They've also each discovered the painful secret the other was trying so hard to hide. But have they fallen in love? Told in the language of modern romance—texting, Q&A, IM—and punctuated by Paul's sketches, this clever high-concept YA is full of humor and heart. 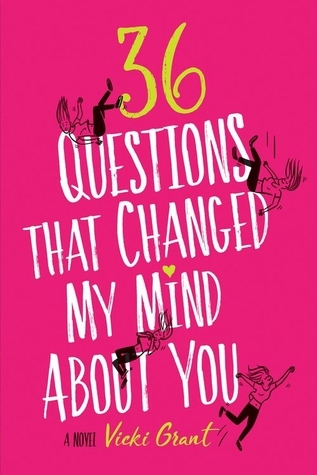 As soon as you've finished reading, you'll be searching for your own stranger to ask the 36 questions. Maybe you'll even fall in love. Disclaimer: I was provided a free ARC for review from Netgalley in exchange for an honest review. When I read the synopsis, the book sounded like a really quick, light, contemporary read which is exactly what I figured I needed in my life in order to get me in the reading mood. It definitely got me in the reading mood, so I guess that's a plus. Just like many YA contemporary books as of the last few years, this book didn't really wow me. It was interesting to read due to the format and the story being structured around these questions the characters are answering, but it was still lacking. The main characters weren't that unique in my opinion and of course the plot was highlyyyy predictable, as if the case with most YA books. For once I would like to read a YA contemporary where I don't see the plot coming. Is that too much to ask for? It's like every book follows a recipe they think will lead to success, and I just want something different, you know? Overall, I thought the book was a solid, "alright". It did draw me in and keep my interest, but that might have more to do with the fact that I read the majority of the book in my linear algebra class instead of taking notes and not actually the book itself... If you want a quick contemporary, this is for you. If you're looking for something a little more... you might want to pass on this one.